Jewish communities in Manchester, Monsey, London and Israel were greatly saddened to hear of the petirah of Mordechai Zev Breuer, a yungerman who touched the lives of many people on three continents. For six years Yidden all over the world davened, first for the chassan who was diagnosed soon after becoming engaged, then for the young man when the illness returned after his marriage. But these were not years of despair. Not for Mordechai Zev, who with every challenge seemed to grow purer and stronger in his emunah and avodas Hashem; not for his dear wife, who never wavered for a moment in her unflinching support of her new husband; and not for his family and friends, who wondered how a person so young could continue to serve Hashem without compromise to such a degree, despite his intense suffering. Rashi tell us in Parashas Chukas, “Mah korbanos mechaprim, af misas tzaddikim mechaperes – just as korbanos offered on the mizbei’ach atone for the sins of Klal Yisrael, so too the death of tzaddikim atones for our sins.” His name, Mordechai Zev ben Chana, forms the acronym MiZBeaCH. Surely, a neshamah so pure was a pure korban for Klal Yisrael. Mordechai Zev, the son of Mr. Yitzchok Yehudah (Yiddy) and Mrs. Chana Breuer of Manchester, was diagnosed with cancer shortly after his engagement to Ruchi Feldinger from Basel. He started treatment and, after he went into remission, they celebrated their marriage. Shortly afterward, the illness returned with a vengeance and the young couple moved to Monsey to pursue the best treatment options. The yungerman and his wife, who was his staunchest supporter and his pillar of strength, were warmly accepted into the Monsey Jewish community – inspiring many with their modesty, limud Torah, avodas Hashem and emunah on a level that is rarely seen in today’s generation. Many in the Monsey kehillah were extremely supportive of the couple and went out of their way to help them wherever possible. Mordechai Zev was a ben Torah and a masmid, and his suffering only seemed to make him stronger. Many a day, he went to the hospital for chemotherapy and then returned to his Gemara as if nothing untoward had happened; the other lomdim in the beis medrash would often not know that he was now on another course of treatment. He was makpid to daven with a minyan whenever it was possible; yet he preferred to daven b’yechidus rather than in a minyan where they spoke during tefillah. When he needed to undergo grueling radiation on Yom Tov, he scheduled his appointment for six in the morning, so that he could be back in shul for davening before sof zman tefillah! 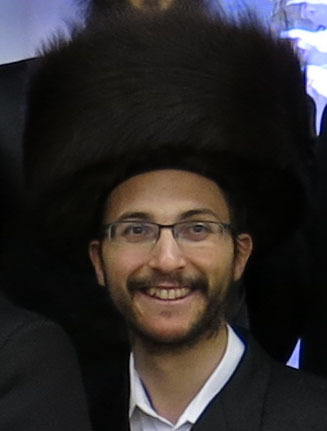 Mordechai Zev was mekabel yissurim b’ahavah — he accepted suffering with love and was always seen with a smile, showing his understanding that everything came from a loving Father. In the hospital, he more than once made a tremendous kiddush Hashem. The other patients there were often surprised to hear that he was the patient, since he empathized with them and encouraged them with such compassion. He developed a close relationship with several doctors and one even became more religious through his influence. He developed a close relationship with many Rabbanim and Gedolim, from whom he drew his strength and inspiration. His erstwhile Rosh Yeshivah of Yeshivas Chug Chassam Sofer, Rav Shmuel Eliezer Stern, a Rav in Rav Wosner’s beis din in Bnei Brak, served as his Rav and mentor. This Rav was like a father to him, and flew to Monsey several times over the years to visit him. He was makpid to always ask his Rabbanim any she’eilos that arose, never looking for any leeway or heter, as hard as it was at the time, sometimes coming out of the Rav’s room with tears in his eyes, but accepting the each psak with temimus. He lived for Shabbos, and made sure to be involved in the Shabbos preparations even when just out of the hospital. Even when he was in the hospital, he sent someone to his house to prepare the house for Shabbos. The levayah on Thursday took place in Monsey outside Beis Medrash Toshnad. A large crowd gathered to pay their last respects to the heroic young man. The maspidim were: The Toshnader Rov, Rav Eliyohu Brisk, with whom he was very close; Reb Eizik Markovits, his chavrusa; Reb Moshe Eliyohu Breuer, his brother from London; Rav Chaim Feivish Schneebalg, a Rav in Monsey; and Reb Kalman Yoel Sofer, a very close friend from Monroe who was at his side until his last moment. From there the mittah was carried to the niftar’s home on foot, and was taken to Newark airport for kevurah in Eretz Yisrael. At the airport, hespedim were said by the niftar’s father Reb Yiddy Breuer and by Reb Chaim Itzkovits, a very close Monsey friend and neighbor who, together with his wife, was a great support to the niftar and his wife. He was laid to rest on Har Hamenuchos, near his grandfather Reb Menachem Breuer of London. May he be a melitz yosher for the whole of Klal Yisrael. The family would like to make a book about Reb Mordechai Zev. If you have any stories or inspirational anecdotes about him, please forward them to Mrs. Breuer, kesherlondon66@gmail.com.